Unsettled Chapter 30-A: "Counting the Cost"
"The Oldest Voice in the Parlor"
Chapter 30-B "The Tree Fort"
We made the tree fort from a small pile of lumber we had in the barn. Our church had built a large new wing and auditorium about the same time we purchased the land, and the construction company had left all the unused building materials behind the church where the busses were parked. Dad was a deacon, and at one of the monthly meetings, the topic of hiring someone to come haul all that stuff away came up. It wasn't Dad who brought up the topic, but with some interest he said, “Why pay someone? Just tell them they can keep the lumber if they haul all of the other stuff away, too.” The chairman, Mr. Miller, shook his head, and in his deep voice replied, “Who would want to do all that work just for some lumber?”. Do I even have to finish this paragraph? Dad borrowed his brother Bob’s flat-bed trailer and pick-up, and in two trips we had all that stuff from behind the church out at the property. The stuff of no use went to the land fill, but all the odds and ends of lumber went to the barn (along with two heavy “I” beams that lay for years along the outside north wall, but Dad knew he would need them for the house). Most of the lumber for the fort came from those scraps in the barn. In hind sight, we should have used “treated” wood to build the platform since it would be exposed to the elements for many years, but that would have cost money, and ideally, a tree house doesn’t cost anything but time and work. Nothing takes the fun out of a Saturday whim faster than the step from "free" to unforeseen expense. Think of all the tree houses you’ve seen in real life or the movies [not ones made by adults ]. Their design and dimensions were probably determined by the materials at hand, held together with a sort of pragmatic charm. The one thing none of us anticipated was that once the fun of the rope swing started, we lost interest in actually closing-in the tree fort or even putting a roof on it. 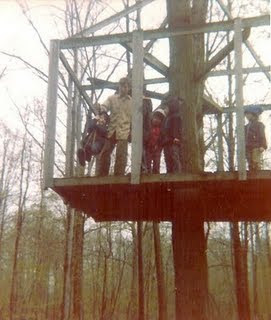 The work of the real house began, and the tree house looked like the picture above as long as it remained in the tree. It was still there long after I was married, but by that time, it had been years since a ladder had breached the trap door. We never spent the night in it as Dave and I thought we would when we first got the idea at the Trinity Oak. It became a platform for the swing and that was enough fun to justify its presence through the years. 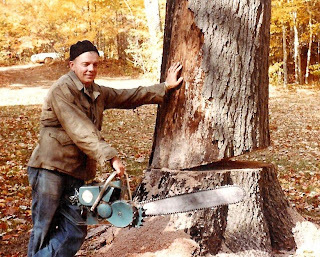 Years later, when only Jimmy still lived at home, lightening struck the oak that held the 70-foot rope swing. Dad had to fell what was left of the tree. 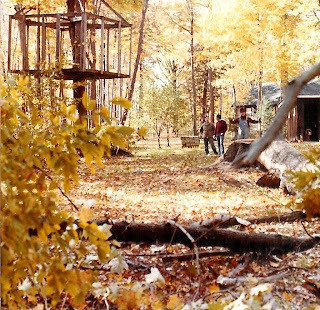 By then the tree house was nearly ten years old. The swing had not been used for years and the exposed floor boards were black and mossy and, in some places, rotting through. Only Jim and my brother-in-law Jack were with Dad the day Dad the old oak came down. It is not how I remember the tree house or the swing, but I can see the mixed emotions in father's face as he leans against that oak. It was an image I recalled in 1996, the year after he passed away in the spring, when I scribbled the lines of "Only the Roots Remain," which uses the tree as a metaphor. in an early spring rain. Today I am in Bad Axe, Michigan, to pay respects to my Dad's older brother who passed away last Monday. My condolences on the passing of your uncle. I have said a prayer for him and those who love him. Thank you. It was good to spend the afternoon and evening with people I haden't seen for many years and to share memories of my uncle many of which included my father. Like my siblings and I, Dad was close with his three brothers and older sister. I have written of camping trips to Georgian Bay Canada. Two of those trips were with my Uncle Jack's family. Steadily time moves on, whether we would have it so or not. Eventually people , oaks and the thing in them fall to the ground and that is simply the way it should be. New growth our way comes which needs tending for the days when we too fall to the earth. Hope things are okay down there in Oklahoma in spite of the shakey start to the football season. We did share many good memories last week as we visited with family we don't get to see very often.